– Colm Herron, author of the hilarious books The Wake and For I have Sinned. If you have ever been young and idealistic and with a few bucks in your pocket and found yourself on an airplane half-asleep on your way to Europe, then this is the book for you. As an early reader I was transported back to a time when young people were often cut giant amounts of slack for their naivete. Why do the old ones take care of the young ones? Do we see ourselves in the smooth faces? JT Twissel’s characters are vivid and funny. As I stated about FLIPKA, her first novel, she has a breezy, ironic, and sure way with words. This is perfect summer reading at the beach; a respite from what the world has become. The Graduation Present is (I suspect)a semi-autobiographical journey through Europe in the late 60’s. The height of the hippie movement is portrayed in dress and thought and we get a clear picture of our long-haired, idealistic protagonist, Riley. The book chronicles humorous trips to France and Italy and through the Swiss Alps… part travelogue, part fiction with a sprinkling of mystery. The young innocent abroad has to deal with the sudden death of her uncle’s friend, her travel companion, and “escapes” in a panic as the police begin an investigation into possible CIA connections. Riley visits some of the usual places, but mostly explores the back roads. Her delight in the “real’ Europe of castles, cottages and gastronomic delights is countered all too soon by feeling lost and estranged by separate cultures. This feeling will be familiar to any traveler who spends much time aboard: at first you are delighted with a fresh way of life and eager to try out a new language, diverse food and then you long for familiarity and communication in the tongue you are most comfortable with. Riley is not only alienated by foreign customs, but by the mores and habits of the older generation she stays with. There is a confrontation of the New World versus the Old World and young and old. This funny account is peppered with clever observations. 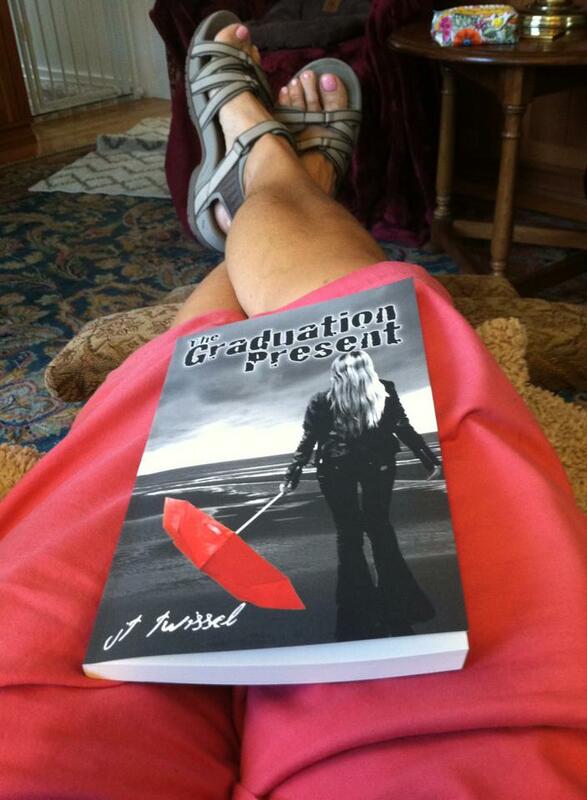 JT Twissel is a polished and entertaining fellow writer from whom I received an advanced copy. Take The Graduation Present on vacation with you, recapture your youth or visit Europe as it was over forty years ago. If you haven’t read Flipka (her hilarious debut novel) you might want to pick that up first.